We’d love your help. Let us know what’s wrong with this preview of Mr Smiley by Howard Marks. To ask other readers questions about Mr Smiley, please sign up. Sadly, this really is Howard's last pill and testament. A memoir that follows on smoothly from the bestseller 'Mr Nice'. 'Mr Smiley' was published in 2015, just months before Marks' death from cancer on 10th April 2016. Coincidently my sister's birthdate, who knew the man for many years in Mallorca. The book is a very well written and fast paced page turner, exposing the dangerous, complex and brilliantly ingenious world of the drug smuggling empire. The brief review on the front cover from Sunda Sadly, this really is Howard's last pill and testament. A memoir that follows on smoothly from the bestseller 'Mr Nice'. 'Mr Smiley' was published in 2015, just months before Marks' death from cancer on 10th April 2016. Coincidently my sister's birthdate, who knew the man for many years in Mallorca. 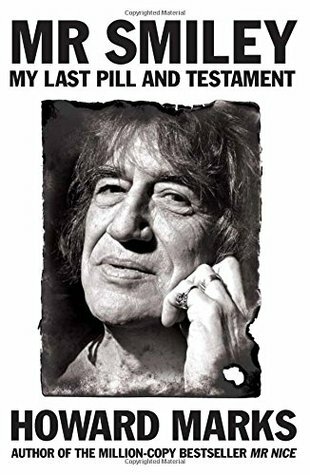 I admit to a great admiration of Howard Marks, a modern day rogue Robin Hood, and saddened to hear of his passing earlier this year. It is approaching fifty years since I was involved in a very large LSD bust, thanks to a grass, and avoided a stretch, thanks to a powerful barrister. I enjoyed this in the beginning but it soon got very boring. I felt like he was really scraping the bottom of the barrel with his last book. Scrapping the barrel. Mr Nice was such a good and informative book and he’s really missed the ‘mark’ here. A well written book about the drug trade a few decades ago. Fascinating information. Howard Marks (born Dennis Howard Marks) was a Welsh author, former teacher and drug smuggler who achieved notoriety as an international cannabis smuggler through high-profile court cases, supposed connections with groups such as the CIA, the IRA, MI6, and the Mafia, and his eventual conviction at the hands of th Librarian Note: There is more than one author in the Goodreads database with this name.